Translated in Spanish, Perdido Key means ‘Lost Island” so the next time your boss or spouse tell you to “get Lost’, just say, “Si Senor or Senora” and come on down. Can you handle 52 miles of this? Catch the next plane and enjoy average temps of 77 degrees and sunshine 343 days of the year. You will love the pristine sand beaches and warm, turquoise-colored waters. 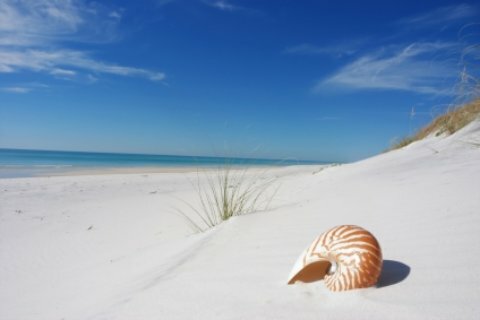 Perdido Key State Park also features miles of protected dunes for the island’s natural wildlife. Activities for the sports minded include kayaking, snorkeling, charter fishing, diving, canoeing, para-sailing and even surfing. History buffs will appreciate delving into the island’s historical museums and forts that go back as far as the Spanish-American and Civil Wars. Two well-preserved examples are Fort Pickens, Fort McCrae and Fort Morgan. Others might appreciate taking their historical adventures to the depths of the ocean blue by way of diving. The island is home to various famous dive sites and reefs. Divers and fishermen alike can explore the stunning reefs or thrill to inshore shipwrecks such as the USS Massachusetts. Florida offers golfers beautiful days on beautiful courses throughout the island. Why should you visit Perdido Key Beach? Where to eat? Top Restaurants in Perdido Key include: Sunset Grille and Pelican’s Perch- both offer American food and plentiful seafood choices. Where to Stay: Rent a lovely condominium such as Eden Condominiums or stay in one of the many hotels such as Purple Parrot Village resort. There are even several family friendly hotels such as Ocean Breeze East or Resort Quest Sandy Key Hotel. Big Lagoon State Park also offers campsite options for outdoor lovers. Perdido Key is located off State Rd. 292, 15 miles SW of Pensacola, FL. 15301 Perdido Key Drive Pensacola, Florida 32507 (850)492-1595.